Andrew Shea strives as one of the premier glass artists of the country, to continuously provide a continuity of creativity, quality, and excellence in every piece. Every piece is handmade, and unique within its own right. Andrew’s work has been displayed in galleries and shows all over country, and is reknowned for such signature pieces as his perfume bottles, fish, and vases. I have been working in glass since the early seventies when I began blowing at the University of Minnesota Studio Art Department. I graduated in 1978 with an MFA in Studio Arts and built my first studio. I have earned a living exclusively in glass since that time. My studio is located in Minneapolis at the corner of East 26th Street and 31st Avenue South, Seward neighborhood, between Lake Street and Franklin Avenue on 31st Avenue South at East 26th Street. I’m open by appointment and on Saturdays, 10 am to 6 pm, mid October thru the holidays. “Studio artist Andrew Shea’s body of work also begs a closer look. 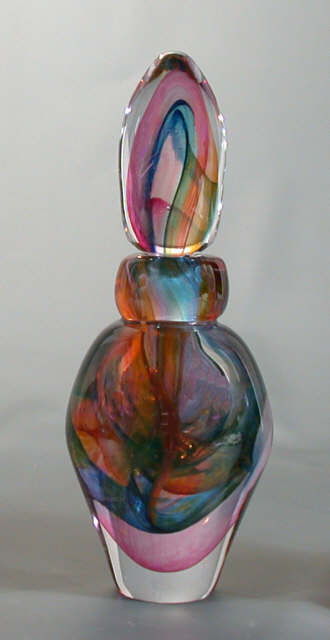 Working exclusively with glass, his most recent creations reflect his interest in perfume bottles, the design of which he believes has been shamefully neglected in recent years…Prior to becoming an artist, Shea studied the sciences and transferred this interest to the study of fine arts and glassblowing in the early 70’s. He has remained within his chosen field ever since, during which time he has received numerous awards and has been referred to as the most important perfume vessel artist in the US..